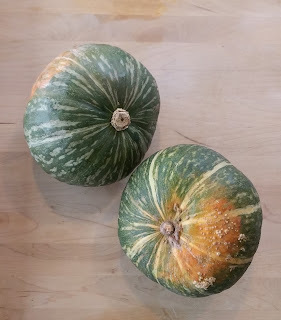 So, have you heard of a kabocha squash because I hadn't until my husband brought it home this week thinking it was an acorn squash LOL! I saw it and immediately knew it wasn't one BUT I was kinda happy because I've never met a squash I don't like (like my friend Andrea says) and I was pretty psyched to try making this one! I read up on Kabocha on a fave blog of mine called Nutritious Eats and learned a lot about Kabocha before making it! If you are new to Kabocha, it’s similar to pumpkin or acorn squash, but even better because it’s even sweeter and has the perfect fluffy interior. Plus it's a nutritional GEM! This anti-inflammatory food is bursting with nutrition. It’s full of beta carotene, iron, vitamins A, C, fiber and some B vitamins. And it’s got 40 calories per cup AND less than half the carbs of most other squash (about 7 grams per cup). Seriously a super food so, needless to say, after making this recipe and trying it, I scurried off to the store and bought some more today! So this basic cooking technique can be applied to any large squash really. Here we go. One of the trickiest parts about large squash is cutting them. Honestly I am in fear at times that I am going to take that large knife and jam it straight into my body because most squash is hard to cut! Like really hard! I had to get pretty forceful with this one and that is why I typically roast mine in larger wedges versus trying to cut it into thin stripes. I mean, I’d really like to keep all my fingers! Just like any other squash you can add chopped kabocha to stews or puree into soups, baked goods or breakfast items like pancakes! I love it just like this though! Preheat oven to 400 degrees. Line a baking sheet in foil. Start with the tip of your knifes in the center of the squash and cut in half lengthwise, using a rocking motion on the knife to get it through (don't try to yank out the knife though). If it won't go through, gently remove knife, rotate half and cut through the other side the same way. Push the halves apart with your hands. Using a spoon, scoop out the seeds and stringy flesh and discard. Cut each half into 3 wedges (lengthwise). Melt coconut oil in microwave, toss with squash wedges. Season lightly with salt, then sprinkle generously with cinnamon. Bake for 30-35 minutes or until fork tender and browned in places. Store Kabocha in a cool, dry, dark place. They can last up to several months. 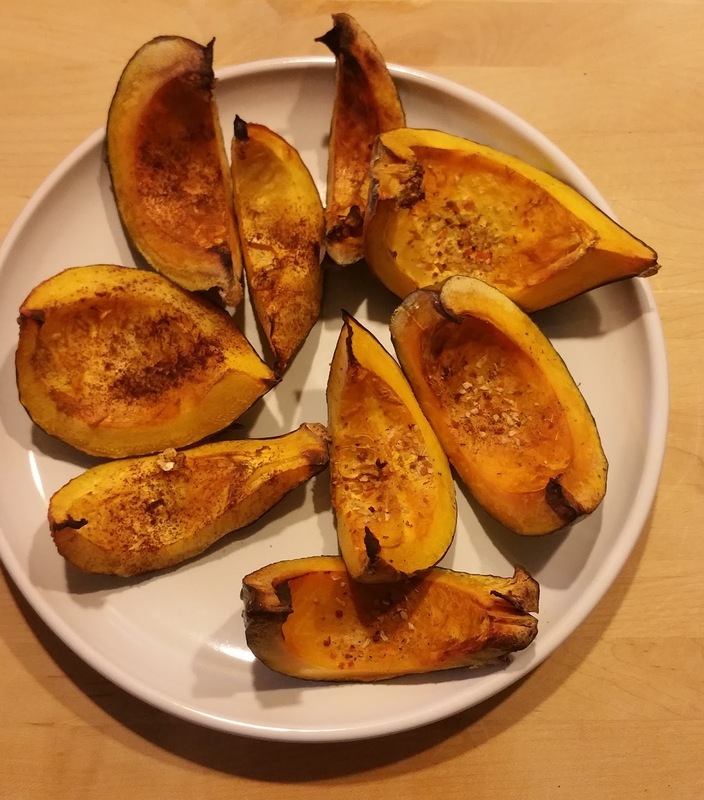 You can use any spices you want to season this squash with, or just basic salt and pepper. It's also good with a drizzle of maple syrup.